Obviously, it’s not Monday, but I created this look earlier this week. I know I said I probably wouldn’t have time to do my nails, but I actually did them on Tuesday. I was going to create a post about them but my brother took my camera hostage. Also, this look isn’t one of my finest. I love the colors and the style, but I’m not very good at it :/ With that being said I decided that I was okay with posting a less an mediocre look, I’m no pro. If you follow me on Instagram, you saw this earlier, but if not, here you go! For this look, I was inspired by a Sally Hansen ad and a picture I saw on Instagram. When I read that Mila Kunis wore the color Tangerine Crush, I decided to check it out. Once I saw Peaches and Cream by Cover Girl, I knew that I wanted to created this two toned look. 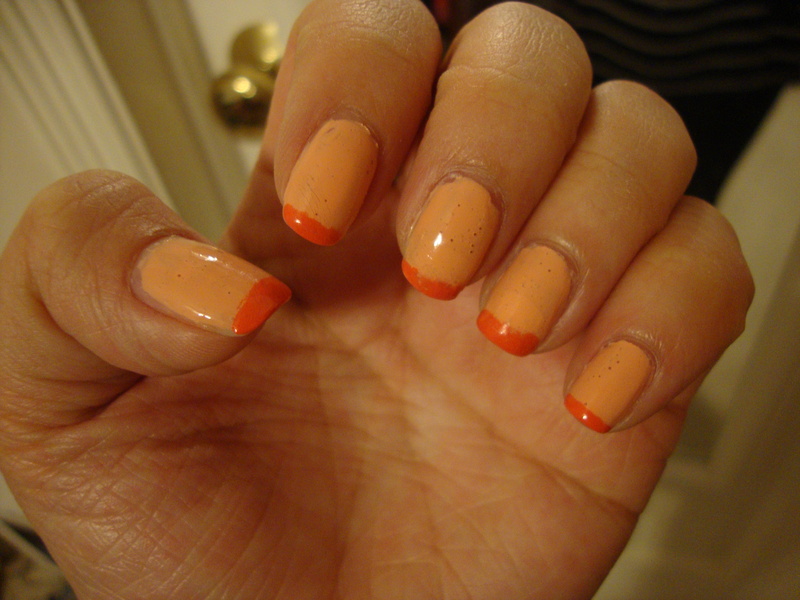 I used two coats of Peaches and Cream because one isn’t nearly opaque enough. Next, I applied a top coat. After letting it dry, I used Tangerine Crush for the tips. As you can tell, my French tips aren’t really my thing. I kept trying to fix them, but they ended up getting worse. The polish got really thick and there are even air bubbles in the polish from applying so many coats. Working in good lighting- At first I worked in dim light and I thought my nails looked pretty good, until I realized none of my tips were even. Good lighting makes it easier to see your mistakes. Resting my hand on my knee instead of the table- When I placed my hand on my knee, it was a little easier to control the brush and you get the tip more even. Instead of painting the tip up and down, paint from left to right- As long as make sure to wipe off excess polish, this ends up working the best because moving from left to right gives you a more natural looking/even tip because you’re following the curve of your nail. I really like the idea for this Manicure Monday even if the finished product isn’t all that great. I love this modern twist on a classic style. I also decided to use these two colors because they look great together and they’re very spring-y. What’s your favorite spring nail look? Do you have any tips on creating the perfect French Manicure? If you do, let me know in the comments below! P.S. I’m not sure if I’ll have a Manicure Monday for this upcoming Monday because I have homework to do, and I’ll be going the rodeo tomorrow to see Demi. Hopefully, I’ll be able to squeeze in a manicure!